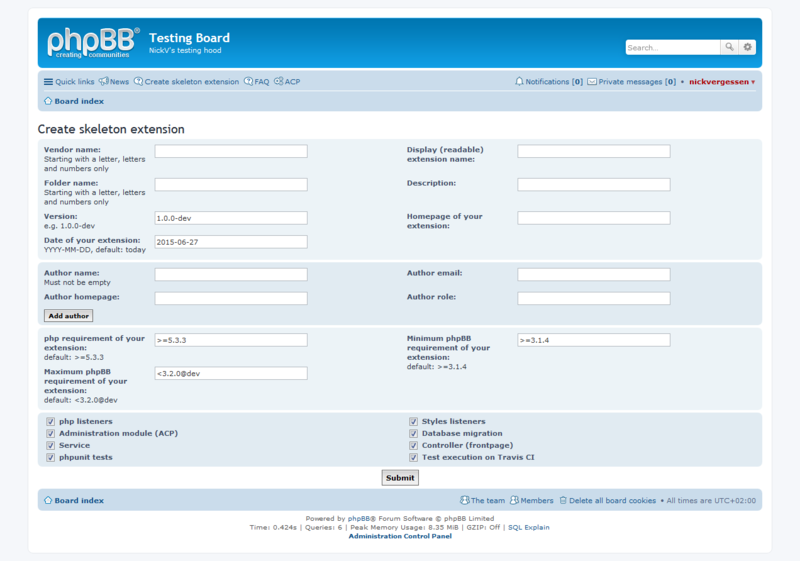 At phpBB’s conference in Prague last year, nickvergessen created a tool that makes getting an extension project started super easy! 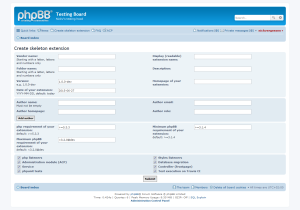 The Extension Skeleton is an extension that you install in your development phpBB board. Once installed, you can use it to generate the starter files and directories for your own extensions. The Extension Skeleton will ask you for some basic information about the extension you want to create, such as the name, author information, requirements, and what type of components it will use (listeners, controllers, styles, template events, unit testing, etc.). It will then generate an extension package based on your needs. It will be a working “skeleton” of the simple Acme Demo extension, and will be ready for you to begin to edit and update with your own code. The Extension Skeleton is a great little tool that every extension developer should have in their toolkit. It simplifies and expedites the mundane task of starting a new extension, and ensures you have a correctly configured set of composer, PHP and style files with which to begin coding your extension.